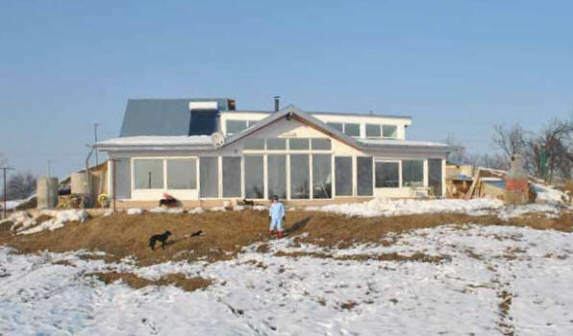 The house also has solar water heating, rain water harvesting, earth tube heat recovery, and provisions for a PV array. The house is heated entirely by sun and wood, and the total firewood bill for a full winter is only $70! After 20 years of stressful work as technical manager for a private company from Bucharest ( Capital of Romania) I decided to find a nice and quiet place and build a home with no future expenses. My children (two boys and a girl) have finished their school, have jobs and need their own home to have a family. My wife and I have always dreamed of having a home in a village with our own garden with trees, flowers and vegetables and our own chickens, ducks, and geese for natural meat and eggs. In 2007 we found a place with 10,000 square meters at an incredible price (0.5 $ per square meter), and with the perfect orientation (N-S) and with all the facilities (water, electricity, natural gas and good road). 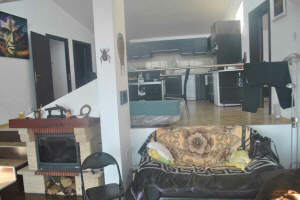 The property is located at the border of the beautiful village of Filipestii de Padure. We bought a trailer and in the autumn of 2008, we built the foundation. The next year, in May, we permanently moved there to finish the home. After six moths we had moved in our new home, but still, there were still things to finish and mistakes to correct. Plan view of the house as built. 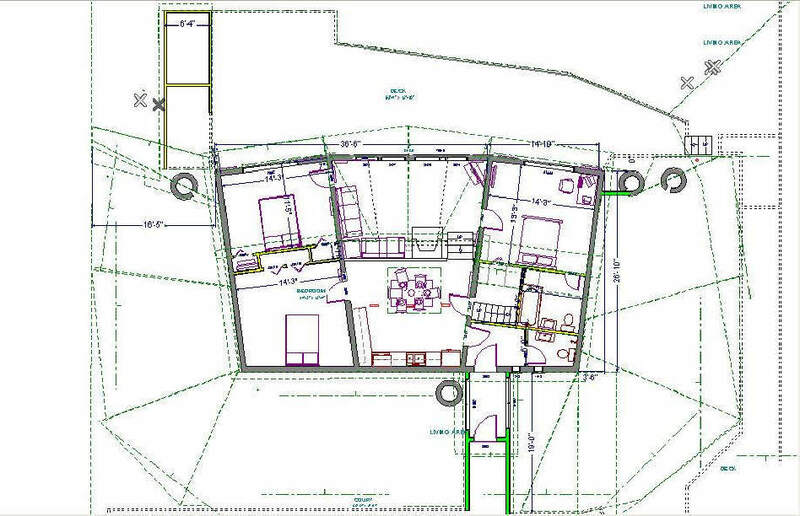 The picture above shows the floor plan for the house. This is the final version after 6 months of studying American web sites about earth sheltered homes. We probably went through 50 versions to get to this final one. The South half of the house (with the large windows) is 0.8m (2.6 ft) lower than the North half. 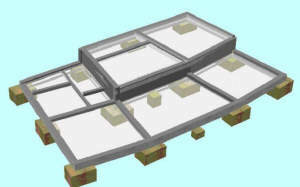 This was a terrain opportunity for having South windows for North rooms as you can see in the pictures. In these pictures you will notice, on the left and right sides of the South wall, some big concrete tubes (1 m diameter) that are used to stabilize the earth and also to store rain water. There is also one tube on the North side near the main entrance. View of the house from the south showing the main solar features. View showing the interior arrangement. More views of the house from various angles -- click on the pictures for full size. There is only one heating source, a fireplace, located exactly in the middle of the house. The picture to the right shows the airflows for the fireplace heater, and the picture just below shows the hot air vents for the fireplace. 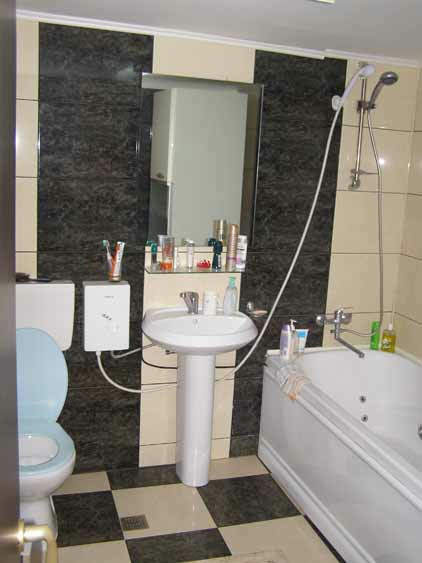 In the NW corner, there is another room located above the main entrance, two bathrooms and dressing. 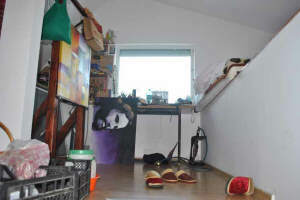 This room is above ground and I use it for painting and other handcraft work. This picture shows the water drainage and earth tube ventilation system. From the picture, you can see the tubes used to drain water away from the foundation (the black lines). One is near the foundation and the other one is 5 meters (16 ft) away from the foundation walls buried at 0.5 m (20 inches), where the extra added soil is ending (to collect and drain rain water). The pink, violet and green lines show the earth tubes used for energy efficient ventilation. Inside of each tube is a small fan (15W), but I don't have to use them because the natural air flow is sufficient. 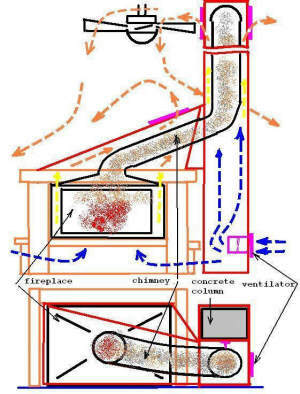 This picture further details the flow of the exhaust air leaving the house. From inside the house the stale, warm air goes down under the floor into the gravel bed. From the gravel bed, the air is pulled out by a blower (right side) into a solar panel which has not been built yet. 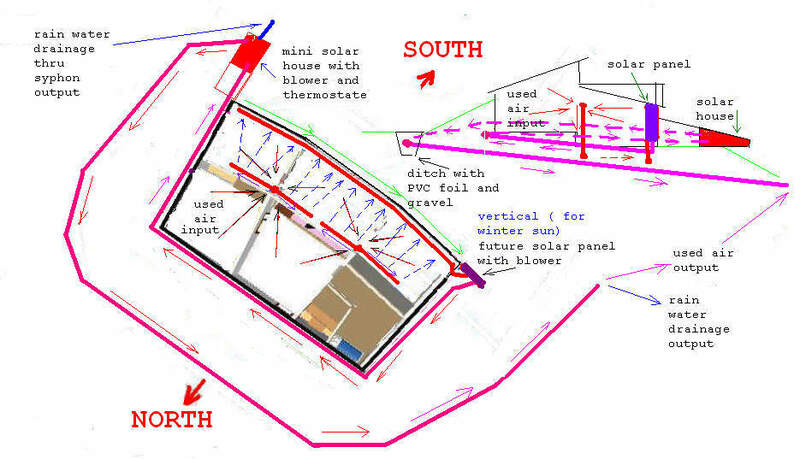 The air is reheated by the solar panel and then pushed thru the drainage tube near foundation, around the house to the small solar house on left side of the house. 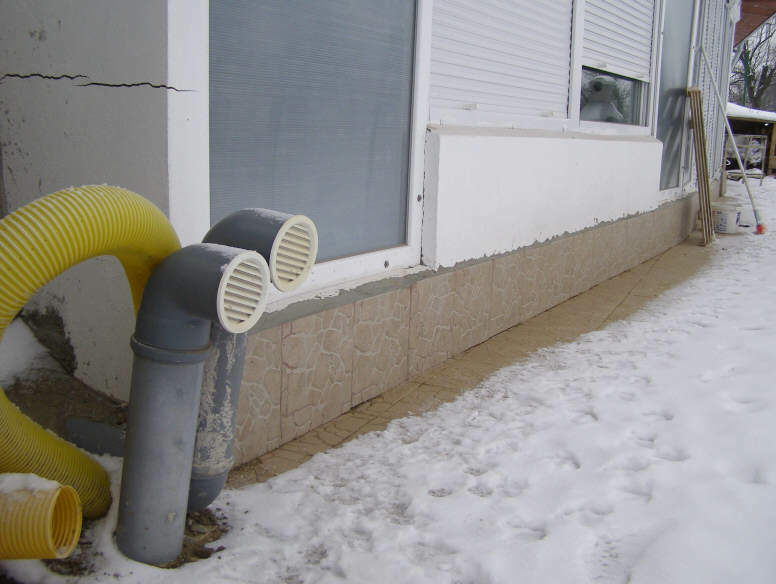 The air is reheated again in the solar house and is pushed by a second blower to the second drainage tube (5m from the walls) around the house, again, and is finally exhausted out to open air. The idea is to recover as much heat as possible from the air before letting it go. 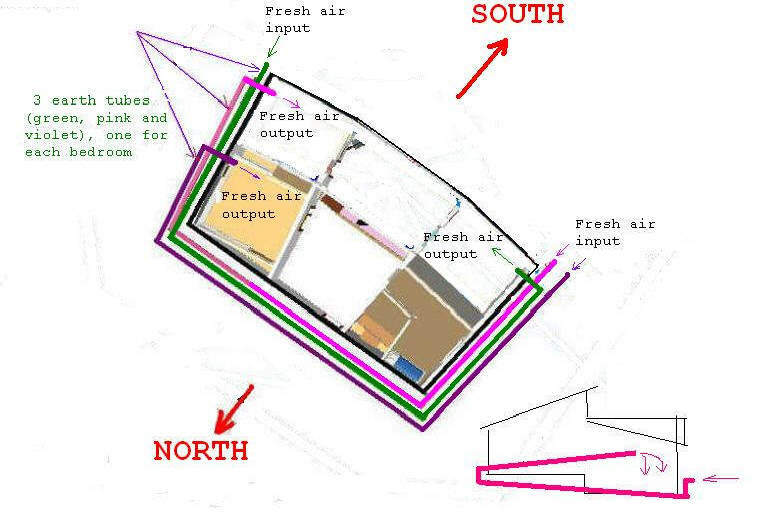 This picture details the flow of fresh air into the house. The earth tubes preheat the outside air before it enters the house. 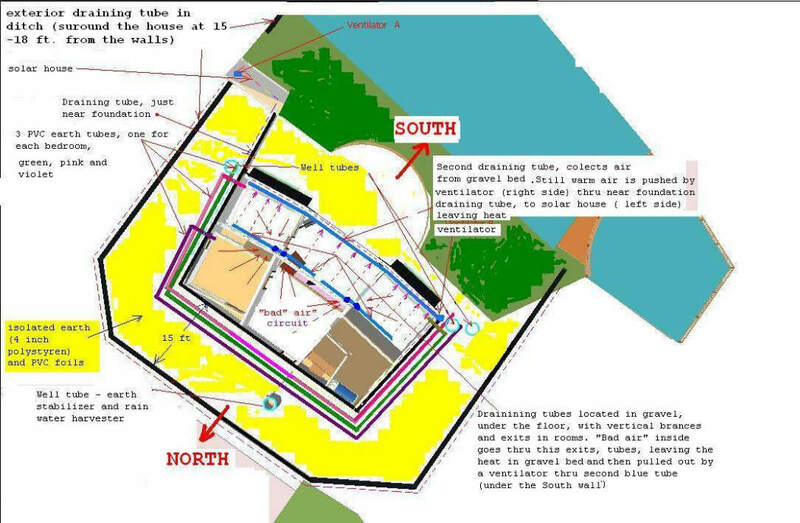 This summer I will modify the plan so that the used air will enter in a Trombe wall, heated (in autumn and winter) then pushed to drainage tube outside foundation ( black line) surround the home and enter in a small green house (on the left side) heated again ( in summer) and pushed again in the exterior drainage (5m from the walls) surround the house and the exits. In the picture just below you can see the excavation and the steel rebar for future foundation. Under this foundation , on each corner of each room there is a cube of steel reinforced concrete. Actually, these 12 cubes are the real foundation. This was necessary because the soil is sand and gravel -- the shore of an old small drained river (the river was diverted 70 years ago when the railway was built). The walls will be heavy concrete blocks filled with steel reinforced concrete, and needed good support. The foundation preparation and pour. The pictures above show the completed foundation. Extruded polystyrene insulation was used on South wall, since it would not be buried. These pictures show placing gravel between foundation lines. Notice the yellow and orange tubes (blue lines in blueprint) used to extract bad air from inside. Orange tube have a branch that will continue vertically thru the wall. Passing the stale but warm air through the gravel under the slab recovers some of the heat in the air. Pouring the floor concrete. Plumbing and electrical outlets are fixed in concrete. Note the steel bars coming from foundation on each room corner and on the middle of the future walls -- these will tie into the block walls. This picture shows the technical basement, which is used for plumbing distribution. 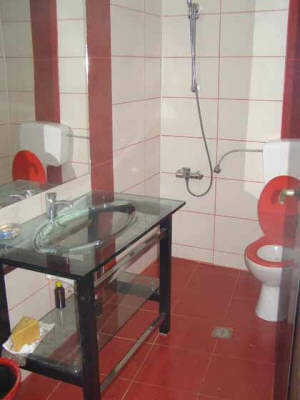 This room is in the NW side, below the small bathroom and main entrance. 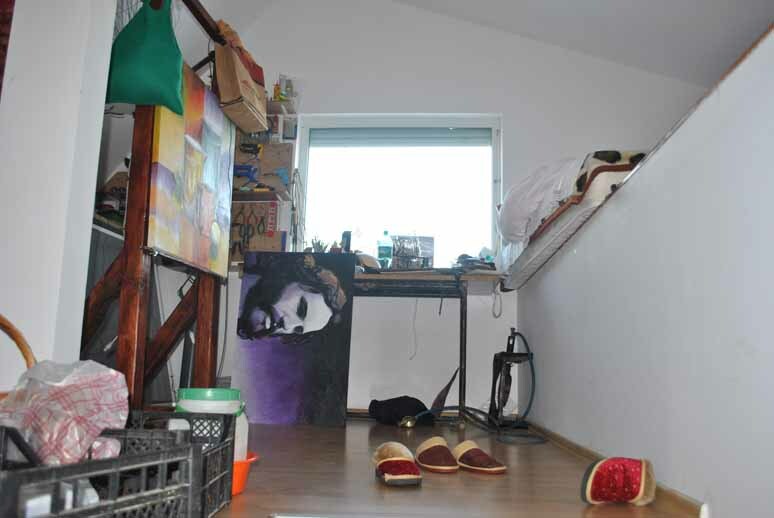 The level of this room is 1.8meter (6 ft) below the lowest level of the floor . Building the walls with reinforced concrete blocks. Every two rows of concrete blocks, I placed two horizontal steel bars. Every two concrete blocks we put a vertical steel bar except the corners where are four steel bars. The workers are locals who had never built a house like this. Everyone ( except my wife), including architects and construction engineers told me that I was crazy to invest my money in an underground house. I lost the pictures of drilling the walls and mounting the boxes for the electric outlets and switches (0.08meter in diameter). Flexible tubes with electric wires were fixed in these boxes. The cables for the outlets where already there in the floor. For the switches they go up to the top of the walls. Please notice, on South walls, the twelve big drilled holes (6 up and 6 down). Each pair of holes ( with a tube inside) will be used to circulate air to a 1x2meter Trombe wall. Each of the three rooms on South side have two Trombe walls. Each bedroom has an earth tube hole in the external wall. The walls were plastered with very strong waterproof plaster and fiber glass net After all electric wires and plumbing tubes was in place, I placed the vertical steel bars and poured concrete in walls. Building the wooden mould for the top concrete "belt". This steel reinforced "belt" will copy the foundation on the top of the walls for a stronger 3D structure. Before pouring concrete I mounted, inside the mould, electrical "boxes" with flexible tubes with wires to distribute power to switches and lamps from general electric box. After water proofing the external walls (special black "paint") its time for foundation drainage. First the Polyethylene film, then special tube buried in gravel. Installing the earth tubes for fresh air ventilation. The incoming air was heated to 16C by its passage through the tubes when the temperature outside was -10C. Even though I am a heavy smoker, the air inside is fresh (not always in the evening but completely odorless in the morning). 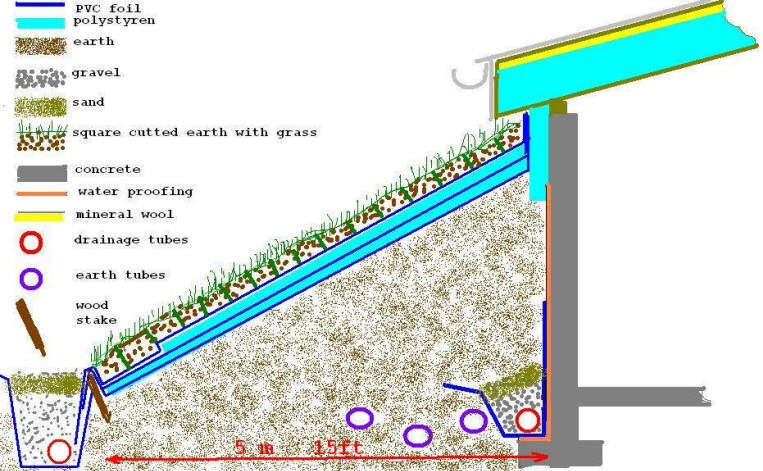 In this picture you see (near the outside earth tubes exits) two yellow drainage tubes --one comes from under the house and the other one goes around the house, near foundation. This is the right side from the plan where the solar collector will be. On the other side of the deck is the small solar house ( near the barbeque). This circuit is a little bit complicated (twice wrapping the house and twice reheated) but this air is always warmer then outside winter air. 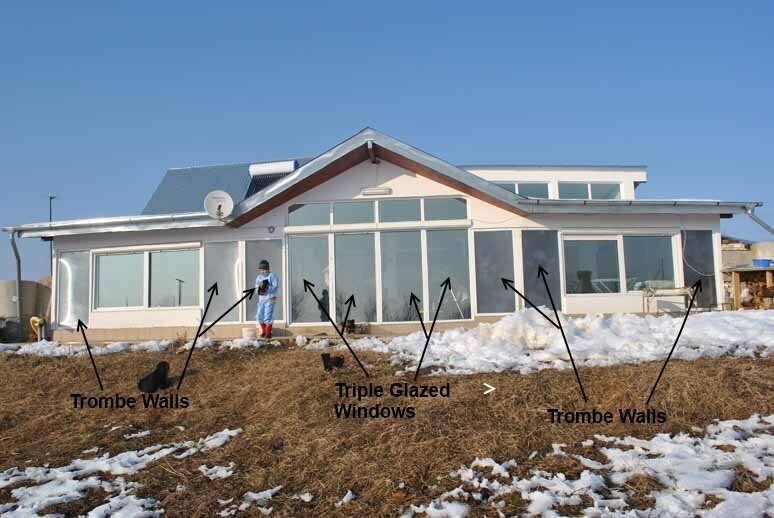 The blowers are controlled with an egg incubator thermostat located inside solar house. Erecting the roof. Inside wooden frame I put 0.2m (7.8 inches) of polystyrene an 0.05m (2 inches) of mineral wool with aluminum foil. The polystyrene blocks that fit between the roof rafters are cut so that they are a friction fit. The roof was covered with wooden panels, asphalt foil, special polyethylene film and finally with corrugated, galvanized steel. Galvanized steel is the best solution, because in summer time will reflect the sun rays, keeping cool air inside ( there is no attic to provide isolation). The workers installed the corrugated steel at night because during day time they can be blinded and cooked in 5 minutes. All of the excavated earth was used to build a hill around the house (except for the South wall). The exposed part of the walls were insulated with 0.1m (4 inches) polystyrene . The insulation extends for 0.5m (20 inches) under the earth line. Big "blankets" of polyethylene and 0.1m (4 inch) polystyrene blocks were assembled on plane ground and then pulled over the hill. Polyethylene was sewed around to keep polystyrene blocks well joined inside. The blankets were covered with small squares of cut earth with grass. 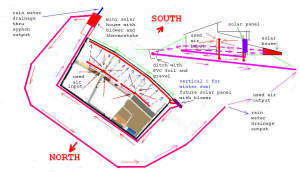 Diagram showing the berming, insulation, waterproofing and drainage scheme. It was impossible to throw earth with the shovel over polyethylene. This summer I will add over an extra 0.2m (8 inch) blanket of earth, because, now, there is not enough earth to keep the grass alive. All windows are triple glass and have exterior shutters (extra isolation on winter night). a) It is not transparent as glass -- the concrete wall is heated only up to 35C-38C in sunny winter days. b) It is not as good an insulator as double glass, so there is more heat lost in cold winter nights. c) Static electricity glues dust inside, which makes the glazing more opaque to the sun's rays. d) The polycarbonate will be reused for a small glass house where can be bent to be stronger in "ice rain" or wind case. This is what you see from North. Normally this view from the road is considered the front facade in Romania and is made the most beautiful. Not in my case -- I prefer to see nature, which is refreshing and beautiful in all seasons. Inside walls were plastered and ceilings were covered with gypsum boards. A dusty job. Interior views taken January of 2011 with no fire going. The guy with white beard is me. My friend wants this picture to remember how hot it was inside, without any fire in fireplace! Views of the master bedroom. 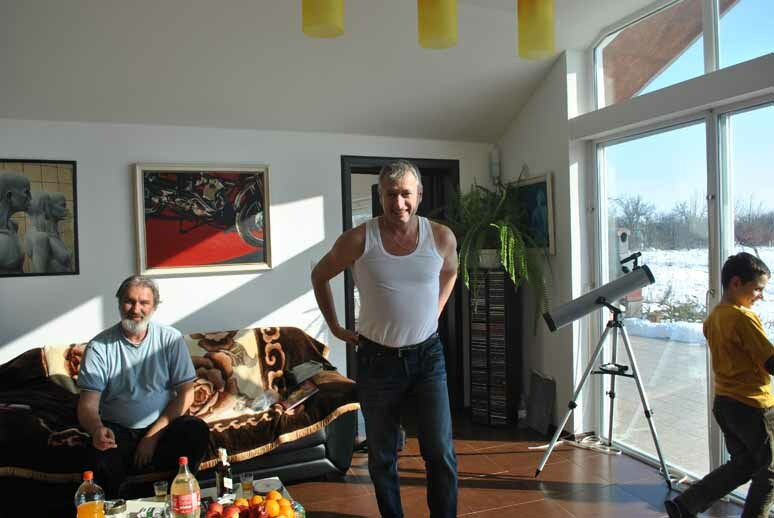 Notice how far the sun's rays penetrate the room (pictures taken on 1st of January). This is the only room above ground level. The room has 2 levels, the higher level ( above small bathroom and main entrance) is used for storage and, sometimes as a big bed if we have lots of guests. 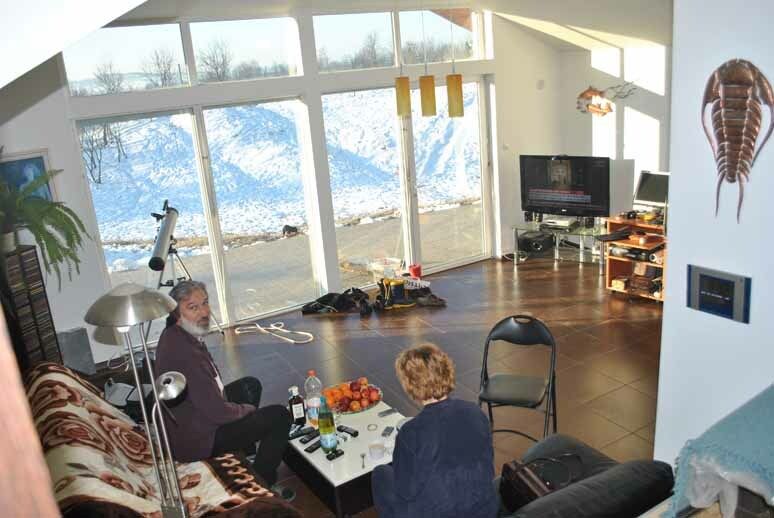 The South roof of this room has a 70 degrees slope for the solar water heater and for future photovoltaic panels. This angle is perfect for winter when I need the highest solar radiation. 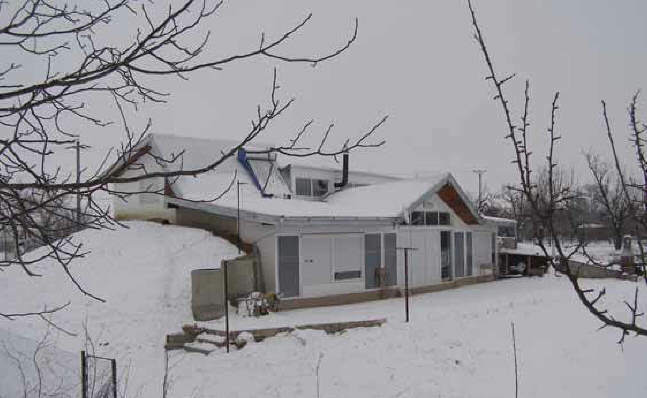 All other roof slopes are about 12 degrees, which is better for a horizontal ceiling sensation and also keeps the snow in place (as a blanket insulation in the winter). The 3rd bedroom. Between these bedrooms there is a wall made by 3 wardrobes, one for this one ( in the middle) and two for the other (lower) bedroom. Hihg placed windows are also in kitchen. The living room as seen from kitchen. The fireplace chimney is attached to the middle column and is covered with fire proof gypsum board. 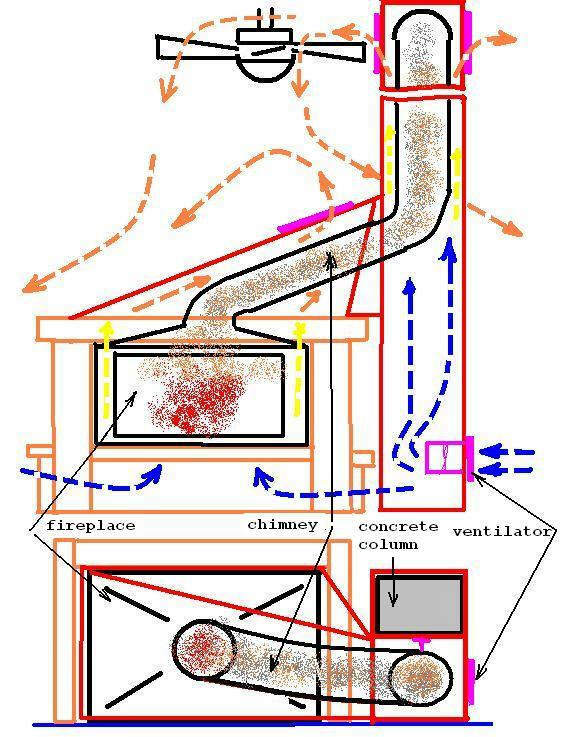 A 15 watt blower pushes air from living room floor, thru through the box that surrounds the chimney, recovering heat from chimney. 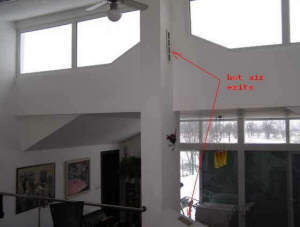 The heated air exits in kitchen near the ceiling where a big fan pushes it down to distribute it. The hottest period inside is from late autumn till early spring (27C - 29C) but usually is from 18C (in the morning) to 23C ( in the afternoon). From late spring till early autumn the temperature never exceeds 27C, but usually is between 20C(morning) to 24C(afternoon). When wood is burned in the fireplace, the air is faster freshened by earth tubes ( you know why). Cristian adds that if he were to do the house over again, he would probably make the south window area about 20% smaller, while increasing the Trombe wall area about 20% to balance out the day and night temperatures. Some of the high temperatures noted above were due in part to not being able to use natural ventilation because the mosquito screening had not been installed. They also plan to plant some grape vines along the deck to provide summer shade. Christian also points out that they get several day periods of several sunny days in a row in the late fall, winter, and spring. The house heats up to temperatures as high 29C, and it feels great! Over the winter, we burned 2 cubic meters (0.6 cords) of wood, which cost $70! The house is located at 45 degrees north latitude and has a long and cold winter season. We have lived in the house for two winters and one summer and the house works perfectly. Each winter I've used less then $70 for firewood and the temperature inside the house has been between 17C and 27C. 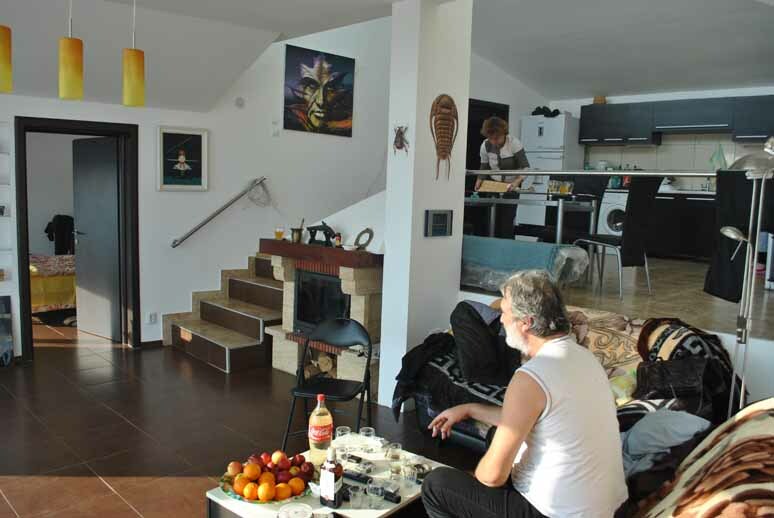 In this climate, a conventional construction home with similar living area, the heating season extends from the middle of September until the beginning of May and the cost is at least $300 per month. I would like to thank my wife for many good ideas, but mostly for supporting me when everybody said I am crazy to put our money in such a project. The next projects are building a small green house( 2m x 3.5m) and erecting my wind turbine (the 250W generator is a brushless direct drive motor from a washing machine). Cristian's home in the winter. 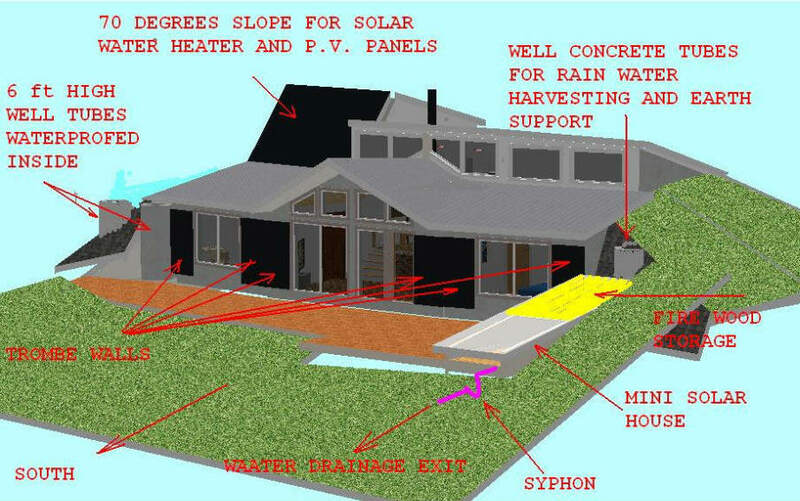 In addition to the great thermal envelope, note the solar water heating and the rain water collection.